As we head deeper and deeper into the world of The Walking Dead, the lines between “good” and “evil” are blurring so much that they’re becoming hard to see. It’s something that has been happening over the course of the last several seasons, as countless episodes have documented individual struggles characters have had with embracing their darkest sides in an effort to survive another day. But on this past Sunday night’s episode, well, that line between good and evil was uncomfortably nonexistent. The 12th episode of Season 6, titled ‘Not Tomorrow Yet,’ primarily centered on the “good guys” storming the castle of the “bad guys,” as Rick and company made a pre-emptive strike on the villainous Negan and his so-called Saviors. Mind you, they’ve never actually come face-to-face with Negan, but based on stories told by the members of the Hilltop Colony, not to mention an explosive encounter Daryl, Abraham, and Sasha had with Negan’s men, Rick ascertained that the Saviors would soon be making their presence known at Alexandria – and that was just something he wasn’t going to let happen. Of course, we won’t pretend last night was the first time we ever saw our beloved heroes brutally dispatch other humans, but there was something different about the attack on the Saviors. Whereas previous acts of brutality have been carried out by Rick and friends under an immediate threat to their own safety (as in, they literally had to kill or they’d be killed), the cold-blooded assault on Negan’s men was mostly unprovoked, and it showed a darker side of our heroes than we’ve ever seen before – a testament to how horrifying the episode was, because we’ve seen them go pretty dark in the past. Under the cover of night, our friends – and let’s face it, they’re totally our friends at this point – first sliced up two guards at the entrance to the compound, and once they found their way inside, they killed another group of men in their sleep. Watching Glenn coldly and silently stick his knife into the brains of two sleeping strangers – his first human kills, it must be pointed out – was undoubtedly one of the most uncomfortable and genuinely horrifying moments in the history of the show, calling into question the very thing we’ve taken for granted the past six seasons: our friends are the good guys. What makes a character “evil,” in the context of The Walking Dead? In previous seasons, characters like the Governor’s men and the Wolves attacked the compounds our heroes have called home, and we instantly knew they were evil because they were opposing the so-called good guys. But now that we saw the good guys carry out an even more horrifying game plan than we’ve seen the bad guys carry out in the past, can we really still even call them the good guys? Or are they only the good guys because we’re being told this particular story from their point of view? At this point, I believe the latter to be true. And that realization, though it’s been hinted at many times in the past – the similarities between the Governor and Rick, for example, were undeniable – has taken the show to an unsettling new level. Underneath it all, one thing we know to be true is that Rick and friends are good people, but we’d probably know the same thing about the show’s many villains had the story been told from their perspective. Negan, for example, is being presented as the ultimate bad guy, but what do those of us who have never read the comics know about him so far? Well, let’s see. He lives at a compound where he takes care of his own, and he has no problems strong-arming and barbarically killing others to get what his people need to survive. Sounds like a frightening monster, eh? Sounds like Rick Grimes, doesn’t it? Let’s take that comparison down an even more uncomfortable path. We know, at this point in time, that though Negan may be strong-arming the Hilltop Colony and using them for his own benefit, he has at least allowed them to live – a luxury Rick didn’t even consider offering to the Saviors. So is Rick even more sadistic, terrifying, and monstrous than the most evil villain the show has yet known? 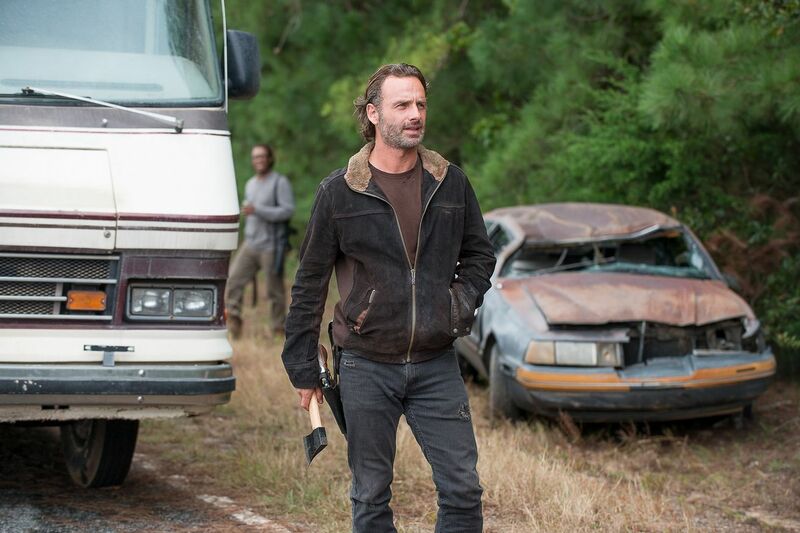 As one of the Hilltop citizens pointed out last night, in the wake of Rick going all Mike Tyson on a severed zombie head, Negan may be a pretty bad dude, but he’s got nothing on Rick Grimes. He’s got nothing on our hero. So who’s the real villain of The Walking Dead? It all depends on perspective.